How small and lightweight is the Z1 Travel CPAP Machine? Very! At just 6 1/2 inches long and weighing only 10 ounces, it is the lightest CPAP machine available. Data recording capability, quiet operation, and the OPTIONAL integrated Powershell with Battery makes the Z1 versatile and portable for use at home or while traveling. Imagine being able to pack a CPAP Machine into a brief case, carry on luggage or a tote. Think how easily CPAP therapy can be made part of an active lifestyle when the tiny machine has an optional lightweight, integrated battery system to use on the go. 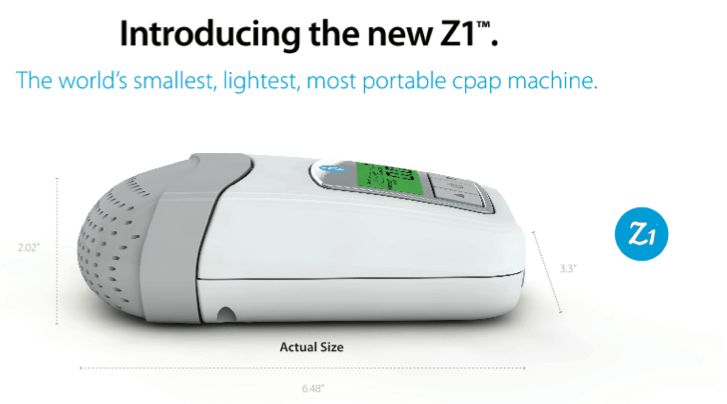 The Z1 Travel CPAP Machine makes it a reality. This is a single pressure CPAP machine and delivers one set pressure all night long. It includes advanced features found on much larger machines meeting therapy needs while traveling or at home.